The Matilda Shorts are a timeless summer style. Designed to flatter, they have a mid rise waist and a loose fitting wide leg. The back has a darts and a center back invisible zip. The front details side pockets and dart pleats. Whilst the Matilda Shorts look very stylish they are so comfortable you will want to wear them every day. 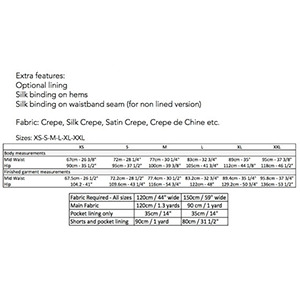 Suggested fabrics are crepe de chine, peach skin,, silk crepe, and satin crepe.